Bless him, our young bull just wasn’t tall enough to properly address our new ladies. 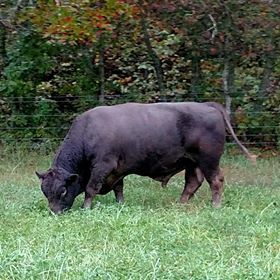 Realizing this was a serious issue, we made a few quick calls and promptly procured the handsome sire, Bulldozer. A quick glance in the field and you could mistake him for a buffalo, but he’s all Murray Grey. He was immediately interested in his field companions, and they found him udderly–uh, utterly–fascinating.